Honolulu, HI – The Department of Human Services (DHS) has opened an additional application period for its Preschool Open Doors (POD) program and encourages families to apply between May 2 and May 31, 2016. Applications received during this period will be considered for preschool participation during July 1, 2016 to June 30, 2017. This program, which is currently serving more than 1,100 children statewide, provides child care subsidies to eligible low- and moderate-income families to pay preschool tuition. POD aims to provide children whose families might otherwise not be able to afford preschool the opportunity to gain essential skills to be successful in school and in life. To qualify for the program, children must be eligible to enter kindergarten in the 2017-2018 school year (born between August 1, 2011 and July 31, 2012). Families are reminded that a child must be five years old on or before July 31 to enter kindergarten. Families may choose any one of the 438 state-licensed preschools. Underserved or at-risk children receive priority consideration for the POD program, and funds are limited. 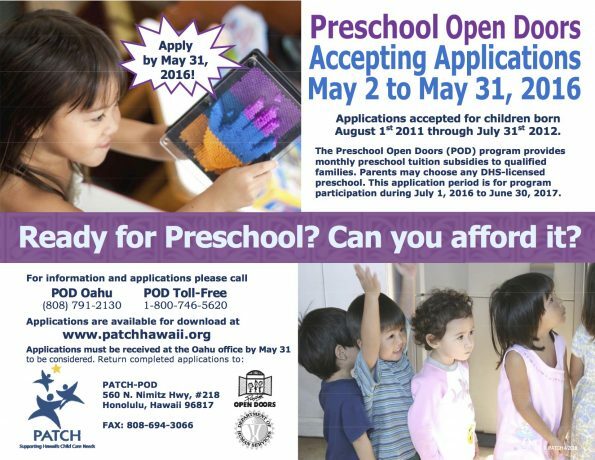 Interested families may request an application beginning May 2, 2016 from the Department’s POD contractor, PATCH, by visiting patchhawaii.org/ or calling 791-2130 or toll-free 1-800-746-5620. PATCH can also help families locate a preschool convenient for them.